The militants 25 times violated the ceasefire. The situation in the area of the antiterrorist operation in Donbas remains tense. Over the past day, militants on 25 occasions violated the ceasefire agreement by using mortars. One soldier was killed and another was wounded in action, the press center of ATO said in a Facebook release. In the coastal sector, the ATO HQ recorded instances of shelling by the enemy. 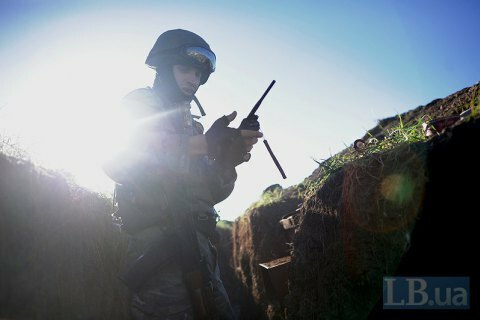 The strongholds of ATO forces in the areas of Shyrokyne, Lebedynske, Vodyane, Hnutove, Pavlopil, Novotroyitske and Maryinka were fired at from small arms and grenade launchers. Near Shyrokyne, the enemy fired from 82-mm mortars, and used 120-mm mortars that are forbidden by the Minsk accords. In the Donetsk sector, terrorists carried out eight armed provocations. In the morning and in the afternoon they led fire from the northern suburbs of the temporarily occupied Donetsk. Militants repeatedly opened fire from small arms, heavy machine guns, grenade launchers and from time to time – from the IFV armament to the defense fortifications of the ATO forces stationed in Avdiyivka, Opytne, Pisky and Nevelske. Late in the evening, the militants shelled the ATO positions in the area of Troyitske on the border of Donetsk and Luhansk regions. Here, the terrorists employed 120-mm mortars, IFV weapon, grenade launchers and heavy machine guns. It was also uneasy in the Luhansk sector, where militants shelled the strongholds of the ATO six times, albeit did not use any prohibited weapons. Ukrainian units that defend the settlements of Old Aydar, Zhovte, Stanytsya Luhanska, Donets and Krymske came under the fire of grenade launchers and other infantry weapons. ON 10 July, the National Security and Defence Council will consider a bill on the de-occupation of uncontrolled regions of Donetsk and Luhansk regions.